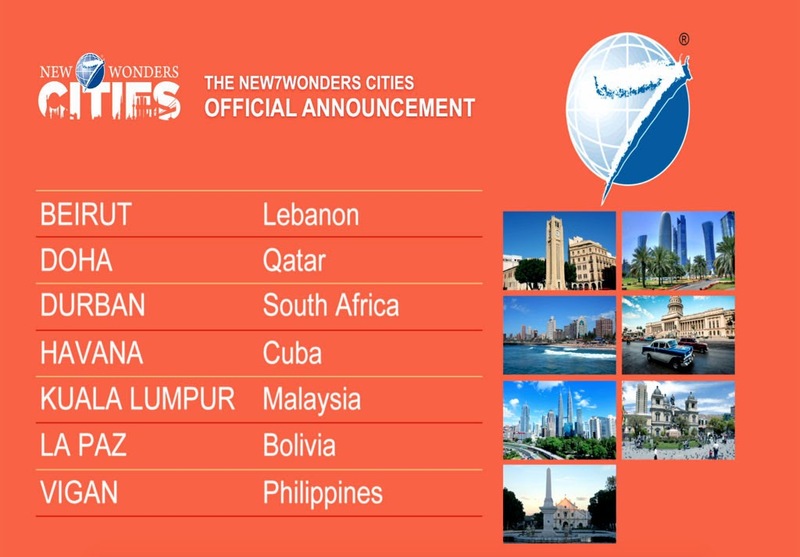 The city of Vigan in the province of Ilocos Sur made the Philippines proud after its inclusion to the 7 New Wonders Cities by the New7Wonders organization alongside Beirut, Lebanon; Doha, Qatar; Durban, South Africa; Havana, Cuba; Kuala Lumpur, Malaysia and La Paz, Bolivia. According to lonerzone.com: with more than 1,200 nominees from 220 different countries In October last year, the selection of the 28 Official Finalist Candidates was done by the Panel of Experts. One year later, in October this year, the Top 14 cities were announced: Barcelona (Spain), Beirut (Lebanon), Chicago (United States), Doha (Qatar), Durban (South Africa), Havana (Cuba), Kuala Lumpur (Malaysia), La Paz (Bolivia), London (United Kingdom), Mexico City (Mexico), Perth (Australia), Quito (Ecuador), Reykjavic (Iceland) and Vigan (Philippines). The 7 winners that was announced via You Tube today,December 8 were determined through voting. The results announced this evening in Dubai are based on the counting of votes since the campaign ended at 7 am GMT this morning. They will now be checked, validated and independently verified. Once the verification process has been completed, New7Wonders will then work with the confirmed cities to organise Official Inauguration events. Note: If it happens that any of the cities announced this evening is not confirmed during the verification process, New7Wonders will issue a media update when this occurs.